from 9 a.m. - 4 p.m.! FREE SHIPPING FOR ORDERS OVER $50! Use the code "FREESHIP" in the shopping cart. It won't be free until you have placed $50 of products in the cart. I welcome you to my online shop--I wish technology had progressed to scratch and sniff screens, but, alas...we aren't there yet! I have been making soap since 1998. All of the products you will see on these pages are handmade by me and are at least 98% NATURAL. The two percent difference, you ask? I use both essential oils and fragrance oils, so the ones using fragrances are 98% NATURAL. I see so many soapers saying their products are all natural, or organic, or gunk-free, but, when you look at the ingredients they are just not being honest. Please visit the links at the left of the page to go directly to our products. If you have questions, pick up the phone and call or text us...or send us an email--there is a link at the bottom of every page! Would you like me to help with your shopping? Tell me the dollar amount you want to spend and I will put together a great gift bag and ship it to your gift recipient. If you have any special requests for the bag, just put them in the customer comments section along with the mailing address for your gift. NOTE: Most giftbags will ship in Priority Mail Regional Rate boxes for approximately $8.00 postage per addressee. Just want soap only? Up to nine bars ship in Flat Rate Priority Envelopes for $6.75! An example giftbag--yours can be customized! Get four 1 oz. (approx) guest soaps in a variety of scents! Get three 1 oz. (approx) guest soaps in a variety of scents, our FishLips Lemon/Lime 100% Natural Lip Balm and two assorted scent Bath Fizzie Sachets in our Chinese Take-Out Giftbox! Our most popular giftbag! 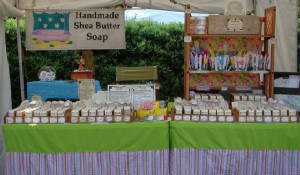 Any three bars of soap, a lipbalm, two bath fizzies and a choice of one of the following: another bar of soap, a wood soap dish, a net soap-on-a-rope bag or a 1.5 oz pot of pure Shea Butter. Get everything in our $20 gift bag, plus add another three bars of soap--mix or match--your choice! Get everything in our $30 gift bag, plus an Herbal Eye Pillow with your choice of fabric cover. Two reasons: You deserve it and your skin may actually need it! Skin is our biggest organ, so keeping it healthy and maintained is necessary for our total well being. For all skin types, our hot processed soaps offer skin loving oils and additives that moisturize and soothe. If your doctor has you on a special soap (just don't tell me it is Dove! ), I will help you select a soap that will really help your skin condition. But wait--I forgot the best reason to buy handmade soap--it is made specially for you by a real person with love and care! Jackie unwrapping the block of one of her favorites--Lilac! 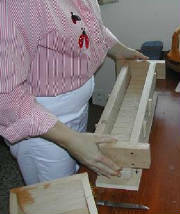 Jackie using the bar cutter to cut the log into individual bars of great handmade soap! 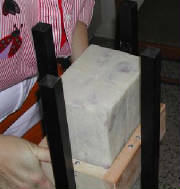 Jackie using the log splitter to separate the block into 4 logs. Why our Soap? Click here to learn why! 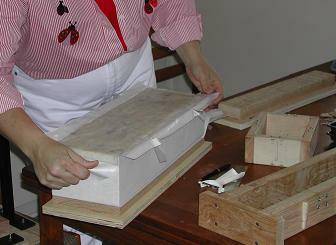 Click here to learn how soap is made. Click here to learn about Shea Butter. Click here to learn about Soapy Stuff in the news and other related topics. Delray Affair Award Winning Artist...ME! 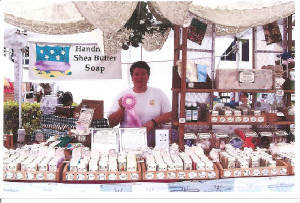 Look for our great smelling "outdoor boutique"
at fine art and craft shows near you.